BBC R&D is extending its IP Studio technology into the cloud, moving production tools into the web browser and using the public internet to transport content. The core of the system is base on an implementation of Advanced Media Workflow Association's Networked Media Open Specifications (NMOS). At IBC, the broadcaster is demonstrating a production system which enables multiple users to produce their own live multi-camera shoot "on demand" using nothing but commodity tools and the internet. Each user receives their own set of browser-based configuration and production interfaces, while content storage and rendering takes place in the cloud. 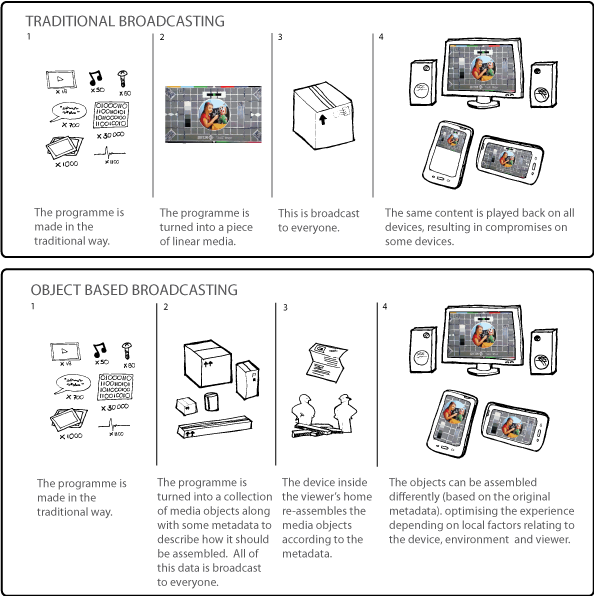 This is another step toward the BBC's long term goal of object-based broadcasting. This conceives media content as a set of objects and uses metadata to describe the relationships, ultimately allowing the assembly of individual media assets more adaptively and effectively. The most advanced research into the area is in audio. BBC R&D, with nine partners including Germany's Magix Software, French researchers BCOM, Fraunhofer IIS, and Munich research body IRT, is part of the Orpheus project which is working to build an end-to-end object-based audio broadcast system based on the IP Studio platform. "Orpheus looks at the whole audio chain," explains BBC R&D's Tony Churnside. "It includes production, storage, and play-out, as well as distribution and reception." To develop, implement and validate an end-to-end object-based broadcasting chain; to research tools to enable capturing, mixing, monitoring, storing, archiving, play-out and distribution; to support the transition from legacy to immersive, non-linear media usage; to design a reference architecture and implementation guidelines; and to create new, engaging user experiences enabled with object-based solutions. Adds Churnside, "Object-based media is a revolutionary approach for creating and deploying interactive, personalised, scalable and immersive content, by representing it as a set of individual assets together with meta-data describing their relationships and associations. This allows media objects to be assembled in groundbreaking ways to create new user experiences." For this IP-based chain, the researchers are using international standards, including ADM (Audio Definition Model for metadata), BW64 (Broadcast Wave including audio essence and metadata), MPEG-H 3D Audio (ISO/IEC audio codec with interactive and immersive features), and MPEG-DASH (for adaptive streaming). In July, Orpheus produced a pilot radio drama called The Mermaid's Tears at the BBC. Through an app or a web browser, the listener can choose to follow any one of three characters, who move between different rooms. Depending on the listener's choice, the story will unfold from a different perspective compared to other listeners who made different choices. In addition, the listening experience is enhanced by immersive 3D sound, "which is like being in the room with the characters," and by images that are triggered at different times. BBC R&D is also showing developments in HbbTV 2—the updated version of European broadband and broadcast harmonization initiative. For example, it will demonstrated how local programmes or personalised trailers, delivered over IP, can be inserted into broadcast viewing. Apps on phones and tablets can become aware of what users are watching on your TV and provide personalised synchronised content and extra information about programmes. HbbTV 2 technology is being adopted in the UK via the Freeview Play platform. The BBC is committed to moving its TV services (such as iPlayer and connected red button) to HbbTV 2.